In the world of fashion, the name Salvatore Ferragamo carries a lot of clout. And for good reason. For several decades, global fashion centers from Milan to London to New York to Paris to Tokyo have known first-hand how much elegance, class, and style power the Ferragamo brand brings to any wardrobe. If you’re looking to add some class and elegance and global brand power to your timepiece collection, take a good look at the Salvatore Ferragamo Men’s FF3270015 1898 Watch. This watch definitely looks different. It features a stainless steel case with a rose gold top ring courtesy of IP Gancino. It has luminous hands and stylish hour markers. Its gold rose bracelet is composed of two tone stainless steel. 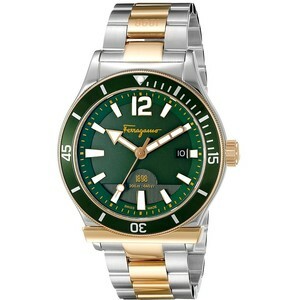 This watch’s ‘show stopper’ or main point of distinction is its bezel, it sports a green aluminum rotating bezel. Talk about daring! If you are looking for a timepiece that is in a higher class then the Orient EM65009D diver watch, and that can turn a lot of heads whether you’re at a purely social setting or in a more formal business environment, this watch has a lot to offer you. Designed for seaside or marine activities, this dive watch has all the looks of a seasoned water-friendly timepiece. Indeed, its green-colored aluminum bezel conjures up images of the inviting green ocean waters and the endless possibilities they represent. Coming in at a diameter of 43mm, this watch is beefy enough to hold its own against other men’s activity watches. What really makes this timepiece stand out for me is the graceful way it manages to deliver the typical impressions of a men’s marine watch while playing off the stainless steel case and rose cold accents of its steel bracelet and green bezel. This is no easy feat. Usually, when ‘top brand’ name watches try to ‘make a statement’ they often fail. They either go overboard with caution and end up giving you a less than imposing presence or they go to the other extreme and you come off as you’ve got something to prove. Thankfully, the Ferragamo 1898 Sport doesn’t involve any of that. Instead, it gives off the very clear impression that it doesn’t have anything to prove to anyone and that you’re comfortable in your own skin. Talk about calm confidence and power! Then again, what else would you expect from such a revered name as Ferragamo? Shipping at a price of over $1700, this timepiece is far from cheap. After all, if you want your wrist to feature one of the most respected names in male haute couture, you need to step up and pay for the privilege. However, if you compare this watch with its peers-as far as brand power is concerned-you are actually, walking away with a great deal with this timepiece. Sure, $1700 might seem a tad bit much for many people but you will definitely be paying much more for similar timepieces produced by brands on the same level as Ferragamo. Viewed from this context, a different question comes to mind. How did this brand make this watch so affordable? Simple. It uses Swiss quartz technology. This movement type lowers this timepiece’s overall cost footprint but ensures a high level of quality and dependability. I believe this is a decent trade off. True to its designation as a dive watch, this watch has you covered even if you find yourself in a deep trench and diving down to 660 feet. While most guys wearing this watch would probably not find themselves anywhere near that depth, having such water resistance at your disposable provides a high degree of confidence and assurance. If you are serious about stepping out and turning heads and you want to do so in a relatively affordable way, give the Salvatore Ferragamo Men’s FF3270015 1898 a look. It’s that good in person. And the price is amazing. Perfect watch. No scratch nothing when I got it.